Organisation design is evolving, and traditional hierarchical models are no longer sufficient on their own. This article links to last month’s topic How to design an agile organisation; however, the format is a little different. This time, I’ve interviewed Nicholas Creswell, who leads talent and development for the global technology organisation at Thomson Reuters (TR). We met at an event where he explained how internal networks can make your organisation more effective. After the Q&A with Nicholas are some practical tips you can apply in your own organisation. Why do organisational networks matter? Traditionally, we’ve assumed organisations count on hierarchy to deliver: effectively, it’s the senior people who use their authority to ensure work gets done. However, as we take more nuanced views of organisations, there’s increasing evidence that highly-connected teams are just as important as hierarchies. The better-connected people are, the easier it is for information to flow and for people to ensure stuff gets done; this means the organisation has better teams, can more effectively deliver, and can more readily adapt to change. This concept is known as organisational coherence: the more coherent an organisation is, the more likely it is to succeed. Why was TR interested in this topic? At TR back in 2016, we had just brought together our enterprise technology teams into a single enterprise entity. Previously, these had been distributed across our business, and had not had strong incentives or structures to encourage them to work closely together. As we created this new organisation, we wanted to understand how information flowed across the company, and who the key influencers and experts were. What did you do for the research? We worked with a specialist agency called Innovisor, who focus exclusively on enabling change through network analysis. They helped us design and run a survey that we delivered to all of our technology staff. In this, we asked employees to tell us who they connect with regularly, who energises them, who they go to for advice, and who they see as experts in key technical disciplines. In the space of a week we got responses from over 8,000 – or 67% – of employees. Innovisor then analysed this in depth, and shared information with us to understand how coherent our company is, and who our key influencers and experts are. What are the roles that people play within networks? One thing we learned is that while leaders are quite happy to deal with people who are less sympathetic if they are competent, your average employee would rather deal with someone who’s sympathetic – and they value sympathy over competence. So an organisation needs to ensure its nice people are also highly skilled, as they’ll be the people others go to in order to get things done. What should you do with people in those roles? 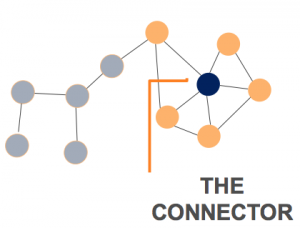 A connector helps a group function more effectively – so it’s important to connect the right people intentionally to them. For instance, they can be a great person to help onboard new employees, or are ideal to get involved in key strategic projects. A broker can either help or hinder an organisation. They might help information flow readily from one group to another, or they might – intentionally or unintentionally – act as a bottleneck. It’s important to understand if their influence is due to their role or their personality – or a mix. You may need to introduce more brokers into the environment, and think about how to include them in cross-business projects. An influencer has their finger on the pulse: they are a great person to meet to find out how the organisation is feeling, and to ensure they understand what leaders are thinking – so they can talk about it when they are next at the water cooler. They drive perception – both positive and negative. They truly are the change agents for an organisation. What worked and what would you do differently? It was very useful to understand the level of coherence within our own organisation, and to get a better sense of how information flows – where this happens well, and where there are challenges. Simply shining a light on this topic has made leaders and employees more conscious of the importance of being well-connected. We found it especially powerful for our leaders to meet with our influencers, and to understand their views on the change in our organisation. Whether 1:1, in small groups, or at more informal events – these meetings provided a great opportunity to take the pulse of how the organisation has been feeling. It was also valuable to have employees tell us who they see as experts: we’ve connected these people with each other, and they’ve made big progress in sharing their knowledge and building capability in critical technical domains. Networks really matter – and the people who make the networks effective are often not visible to the most senior people in the organisation. They are key to an organisation’s success, and indeed they are arguably some of the most important talent you have. If you didn’t have the option to run a full network analysis, how else might you do it? First, don’t assume that a network analysis has to be expensive or complicated. Conducting one gives you objective, hard data that is hard to come by any other way. However, you could always start by standing back and considering the key influencers, connectors and brokers that you know in your organisation – and you can then ask them who they know. This will start to unearth some unexpected names, and can start to uncover some insights into your organisation. Nicholas works with leaders of the 12,000-person technology group to identify, develop and deploy a diverse group of talent to drive Thomson Reuters’ growth. He has worked in a range of talent roles with TR since 2009, often with a focus on the technology community. Before that, he worked at Google, where he established their technical graduate programs across EMEA. Earlier in his career he worked at Korn/Ferry and United Biscuits; he has an MBA with a concentration in Marketing from London Business School. If you are undergoing organisational change, incorporate this thinking into your review of what worked well and what was difficult. Consider how you can share the learning across the organisation, so other functions can also adopt this approach. As always, think about your objectives first: what are you looking to achieve, and what might you do with this information once you have it? How will you follow up on the insights you receive? 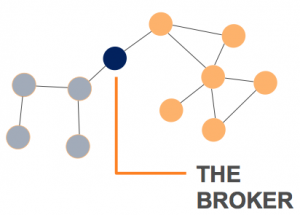 Identify your Connectors and Brokers – what can you give them to work on that plays to their respective strengths? 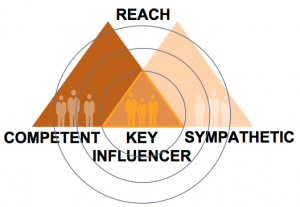 Identify your Key Influencers – remember, they should be both competent and nice. What can you give them to do that will really ‘float their boat’? How can you motivate and engage them? Should you invest in ensuring they continue to have competence and also develop their emotional intelligence? How can you ensure they feel appreciated and valued for their innate skills as well as their technical or leadership role? Engage them from start to finish in your important initiatives, and listen continuously to them to understand the pulse. It’s important for all your teams to be effective, even when they come together, work together, and disband relatively quickly. So, next month, we look at how to get a ‘scrum team’ up and running quickly (in ‘agile’ jargon, that’s a team that may not be together for long). You’ll discover how to make high-performing scrum teams compared with what you might do for traditional teams that stay together longer. This entry was posted in Leadership on May 3, 2018 by rosepadfield.